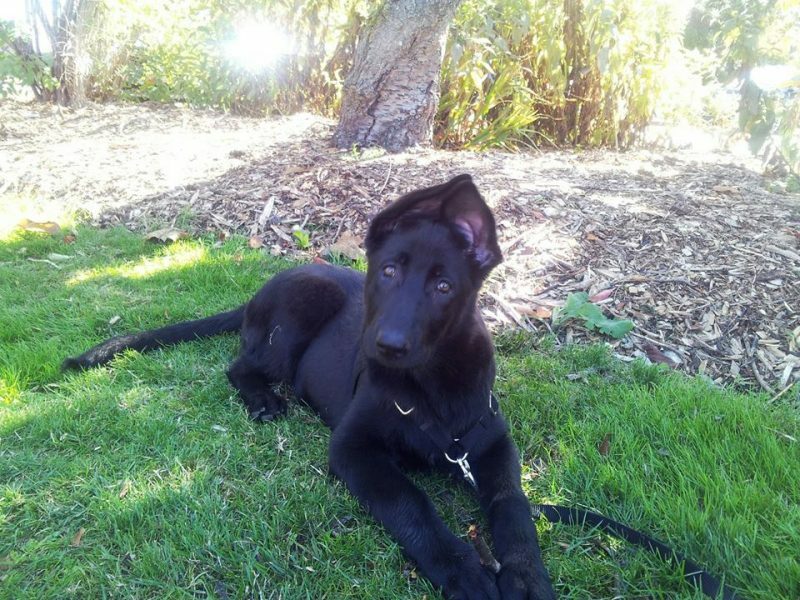 Unless this is the first time you’ve visited my blog, you probably know that my husband and I adopted an all-black German shepherd pup named Ana this past August. One of the many joys of puppy ownership is watching how fast they mature and grow. In Ana’s case, it’s all about the ears. Below I share a 3-month timeline. To make it a little more fun, let’s make it a contest! Comment on the blog with your favorite by midnight on Midnight on December 25. Santa will send one lucky winner their choice of any of the four books in my Downward Dog Mystery series, including A Fatal Twist, which launches on January 8! Ana ears 1: August 4th–almost six weeks old! Ana ears 2: August 15–the day she arrived at our home. The carpet hasn’t been clean since! Ana ears 3: August 29. Starting to look perky! Ana ears 4: September 6th. Maybe I should have named her Ivy! Ana ears 5: September 18. One up, one at half mast. Ana ears 6: September 28. The crossed-ears days. Ana ears 7: October 5. More like a steeple now. Ana ears 8: October 16. One up, one leaning. Ana ears 9: October 26. It’s hard to hide when your ears are so big! Ana ears 10: November 6. Right ear straight up, left a little floppy. Ana ears 11: November 20: Kind of like windshield wipers, don’t you think? Ana ears 12: December 4th. Ah, perfection. And just in time for the holidays! Isn’t the speed of her development amazing? Don’t forget to vote on your favorite in the comments. Include your e-mail address (i.e. Tracy(at)WholeLifeYoga(dot)com) so I can contact you if you win. This entry was posted in dog books, dogs, Downward Dog Mysteries and tagged #anaearwatch2016 on December 19, 2016 by Tracy Weber. Ana was an adorable pup and she has matured into a regal looking dog. I am sure that puppy curiosity will provide you will plenty of stories to share and her poise will make you proud. Thanks Cathy! Do you have a favorite? I always have loved no. 5. I can not believe what a gorgeous girl she has become. Thank you again for sharing her with us. I hope you will keep it up. Thanks Dagmar! That was a very cute (albeit temporary) look! She is a magnificent girl. I cannot choose one favorite, I choose them all! I love Ana ears 4, the one up and one down is adorable! But I’m very pleased she achieved ear perfection on my birthday? Happy birthday! I’m sure she did it to honor you, Gaynol! It’s the favorite so far! Ana is such a regal and beautiful German shepherd. It’s hard to pick just one, but my most favorite of her is Ana ears 5: September 18. One up, one at half mast. That one only lasted a day…. I love them all! She is such a gorgeous dog. She was so innocent back then….NOT! I think #5 is the perfect Ana portrait, but I must say, since you are releasing A Fatal Twist, then #4 has to be the poster child for your new book. Twisted ears, twisted tail, twisted leash, twisted harness, twisted ivy, mildly confused look on her face. Perfect Downward Dog. We all are a little twisted around here…. I love all the stages of those ears but I do like #7, she looks like she is wearing a hood. In number 2 she looks like our first dog. Happy memories! She was so happy that day! Picture 4. First sign of ears with character. Karmas A Killer. That’s my choice. Picture 4. First sign of ears of character. Karmas A Killer is my book choice. And when she first started showing a strong affinity for plant life. I love them all, but number 1 is my favorite! Puppy loves!! Back when we still had the illusion of innocence…. I love Ana’s ears in picture number 4. She is so cute! Love reading your posts about your adventures with her! Happy Holidays! Love the Christmas ears#12…tis the season:) Merry Christmas! Ana looks like quite a handful! Oh man…. Is she ever! Love them all! #7 Super Spy Dog practicing her new WiFi/Radar skills. Will be major Asset in future crime solving! I like the plant slime on her nose in that one. I love that ears 4 picture in the ivy! She has so much fun in plants! I don’t think the plant owners are nearly as impressed. If I have to pick just one, it’s #4. Ana looks so cute in the ivy! #6 is a very close second. Of course, they are all adorable! She can’t seem to take a bad picture! Six! Adorable! What a pretty dog, love her ears! It almost looks like she’s wearing a hat. I like #1, not so much for the ears, but for the expression on her face. Her ears have come along very nicely. That was before she knew she was going to have such suckers for owners. I have to say # 2. Love the floppy ears and the sweet puppy face. German shepherd is on our list of choices when we are ready to get a puppy again. I’ve read they are very loyal and devoted. We want a breed that will be good with our grandchildren. Love that velvety puppy fuzz! Ana is a beautiful girl! German Shepherds are one of my favorite breeds. They are so loving and loyal and they give you all their love. She is so lucky to have you and your husband and you are lucky to be able to give her a good home. My favorite picture is #5, one ear up and one at half mast. She looks so regal and full of mischief. Merry Christmas! She is TOTALLY full of mischief. And very loving. Ana is gorgeous! I love picture #2 when she first came home with you. Thanks! We had no idea what we were getting ourselves into…. I love the puppy ears in No. 1, but No. 5 is so funny and the final is awesome. Favorite: all of them. So if I win, I would like A Fatal Twist. Thanks for the chance. That half-mast ear was pretty cute, wasn’t it! I love them all but #2 is my pick. She is so gorgeous but you can see the mischief in her eyes. Oh yeah. She took us by storm and hasn’t given us a break yet. Hurricane Ana. 😉 I love them all! Number 5, Ana is so cute there as her ears start to stand up ?? Yes to both. Amazing how fast she matured to magnificent, isn’t it? Ana is a beautiful dog! My favorite photo is the second one that was taken on August 15th. That picture is so adorable! Ana is such a beauty!! I love them all but I think number 4 has to be my favorite. Thank you for the chance and Merry Christmas!!!! #2 is my favorite, but she is gorgeous in all of them! Wishing you many years of love and companionship. Enjoy every minute ?. Thank you! We are certainly trying to! Awww…I have to go with number one…she was such a baby there. She sure has a big personality. thank you for the contest. i am an ear girl! i love her most recent “oh so noble ears”, but i also do love the floppy baby ears. someday, you will outsmart her! One can only hope. But somehow I doubt it! Smarter than me, that’s for sure! I’ve loved watching Ana’s growth and it’s really hard to pick one as a favorite. But if I really have to pick one it would be Ana’s Ears 9 where she thinks she is hiding from society in the bush. This pup has more personality than some people even do. Thanks for sharing her with us as well as your wonderful books. She has HUGE personality! Thanks for reading my work! Number 5 is my choioce. Beautiful pup! Maybe she’s going to fall over like the tree? What a beauty! I am really torn, as I think #2 is adorable, but #9 is priceless! She looks like a well-loved, happy pup! She is adored, that’s for sure! All are precious, but ‘Ana ears 7: October 5. More like a steeple now’ is divine. I call it black on red; a study on ears! That chair has never looked better than with Ana on it. She’s so beautiful it’s hard to choose. #12. I’d have to say Ears 4. So stinkin’ cute!! I love Sept 18 where they are trying to stand up. I have loved reading about her antics and how much she has changed and somewhat matured. She matures a little more every day! I like picture one. Ana has such a precious look on her face. She looks great in all her pictures. She is so beautiful and has grown so much. Thank you for sharing. Thanks! She is a total sweetheart! For me Ana ears 8: October 16. One up, one leaning. So cute. How fast they grow. I really loved all of them. But Number 1 is soooo cute. I have loved her journey from then to now. Merry Christmas. She has had quite the journey indeed! And the winner is Kaye Gilgore! Those of you on my mailing list, stay tuned for another contest on this blog article, especially for you! I love Earth photo #4…it’s either the ears or the expression! They are all such cute pictures, but my favorite is #3. What a beautiful dog! She looks like a lot of fun and energetic. Although I know that Ana ears 12 is the proper ones for a German Shepherd, I love the softer Ana ears 2. I like #7. You have a beautiful dog. Thanks for sharing your pictures with us. Thanks all! Those of you entering the contest from my mailing list, please e-mail me your answer at Tracy@WholeLifeYoga.com. The winners will be chosen from the e-mails! I love them all. But if I had to choose, it would be between 1and 5. Thanks for sharing those cute pics! I love them all but since I have to pick I will choose #2. Your Ana is a beautiful girl.I like #6. She still looks like a vulnerable pup. This stage passes so quickly it’s hard to remember all the sweet puppy looks. I am a big fan of books with dogs and am looking forward to reading youur first book. I’ve had dogs most of my life and have worked for dog rescue for many years. We share our home with an English Mastiff and a pound pup who may be a shepherd mix. I love number 1 and number 5, too hard to choose, buttttt number 1 is soooo cute. Ana is such a beautiful dog! I really love #3. I love pictures of young pups and that is such an adorable picture. It’s amazing how quickly they change. It’s so unbelievable that the ears start to stand up by themselves as she gets older. I love Ana’s Ears Two. The winner of the Ana Ears Watch contest from my mailing list is Claudia Kennedy! Congratulations!